All talk recordings are available on our YouTube Channel. DjangoCon Europe will take place in 2018! 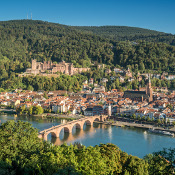 It will take place in Heidelberg, Germany. The conference days are May 23rd–25th. The sprint & workshop days are May 26th–27th. Click here for information on our beautiful venues as well as how to get here. We've assembled a line-up of world-class speakers on Django, web technology and related topics. Check out our agenda for the conference now! We are committed to creating a welcoming atmosphere. Therefore, all participants are expected to show respect and courtesy to other participants throughout the event. We do our best to make it possible for everyone to come. From venue accessibility to financial aid, click here to find out more information and do not hesitate to ask us if you need to know more. Drop us a line at [email protected] if there is anything we can do for you! DjangoCon Europe 2018 in Heidelberg is organized with love by ROSE e.V.